Israel Air Force targets artillery positions of the Syrian regime after three projectiles hit Israel. 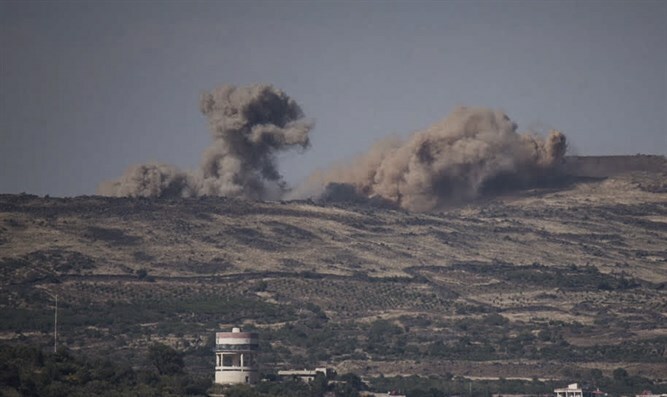 The Israel Air Force (IAF) on Tuesday night targeted artillery positions of the Syrian regime in the Syrian Golan Heights, the IDF Spokesperson’s Unit said. The strikes were in retaliation to three projectiles which hit Israel earlier on Tuesday. “We will not tolerate any attempt to harm Israel's sovereignty and the security of its citizens. We see the Syrian regime as responsible for what happens in its territory. However we will not hesitate to act against opposition elements in Syria,” the IDF’s statement said. On Monday night, IAF aircraft attacked cannons belonging to the Syrian regime in the central part of the Syrian side of the Golan Heights. The mortar exploded in an open area, causing no physical injuries or damages. Defense officials said the shelling was a spillover from the Syrian civil war. Golan Regional Council head Eli Malka rejected the notion that the mortars exploding in Israeli territory were “spillovers” from the Syrian war.